3A PDF to Word Batch Converter is the fast, affordable way to convert PDF document to the popular Word file format, Its easy-to-use interface allows you to create Word files from PDF documents by simply few clicks. AnyBizSoft PDF to Word converts read-only PDF files into fully formatted editable MicrosoftÂ® Word documents with one click. With PDF to Word, users can easily get anything from PDF files and reedit the content freely and conveniently. Tweak PDF To Word is the world's most accurate and best selling method for converting your PDF files to Word documents - complete with text, columns, tables and graphics. pdf to word flash jpeg converter is time-saving and convenient. 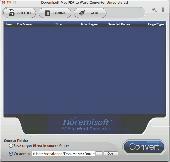 It is designed to convert pdf documents. pdf to word flash jpeg converter is a great helper in the office and at home.